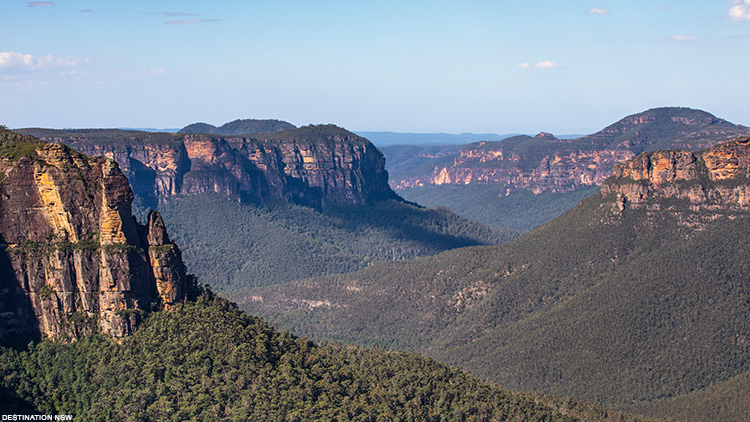 There’s a side to Sydney you haven’t seen, where the colors of the rainbow run wild for three unforgettable weeks. Where art, music, dining, and queer lifestyle is celebrated with spectacular events, parades, and parties. Where a diverse spectrum of LGBTQI cultures are magnified with zeal. Welcome to Sydney Gay & Lesbian Mardi Gras—an iconic, landmark event visited by more than half a million people every year. 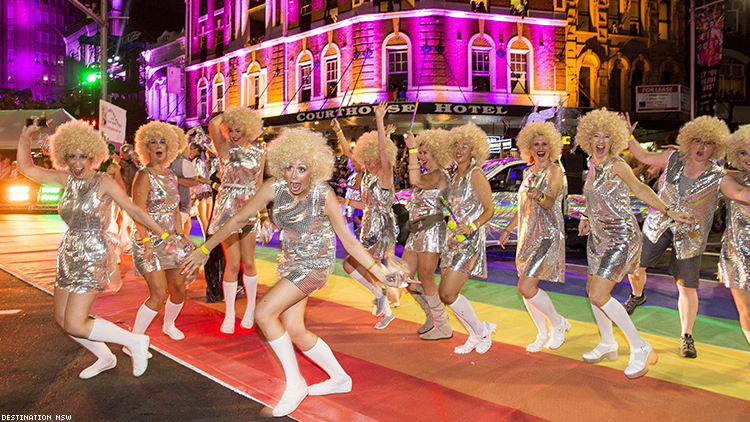 While memorable experiences are always around the corner in Sydney, Mardi Gras with it’s ‘Fearless’ theme in 2019 will be an extravaganza with special appearances, citywide surprises and its world-famous, larger-than-life parade heard around the globe. Want to get excited about planning your trip? 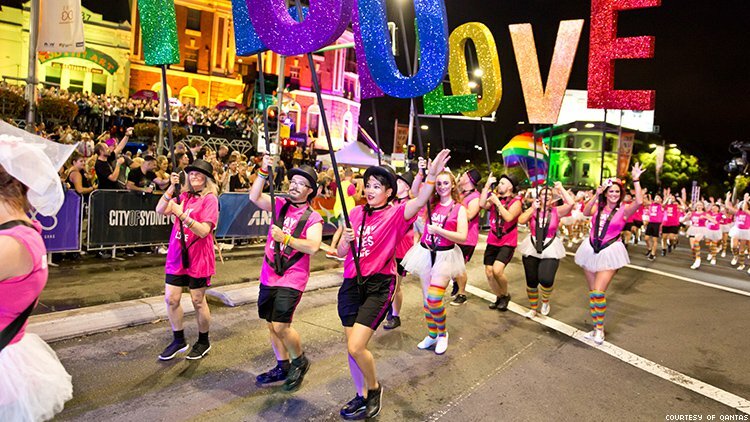 Here are the top reasons to visit the 41st annual Sydney Gay & Lesbian Mardi Gras, running from February 14 to March 3, easily the most anticipated event of 2019. This year for the very first time, festival goers can find the very best in queer art under the one roof with the Seymour Centre transforming into Mardi Gras Central, a hub of cultural wonder and experiences that also features family and dog-friendly Courtyard Sessions of live music, drinks and vintage games at dusk and a late night Festival Club. Over 12 nights leading up to the Parade, the Seymour Centre’s theatres, foyers and courtyard will be transformed, providing a welcoming space to share, celebrate and explore diverse queer identities through performance. Program highlights include the phenomenal circus cabaret Club Briefs, Paul Mac in The Rise and Fall of Saint George, the inaugural Bent Burlesque featuring the stars of the Vienna Burlesque Festival, the world premiere of Shaun Parker’s KING and direct from the UK, The Butch Monologues and the brilliant Cake Daddy. It all culminates with a bang at the Mardi Gras Party, where 12,000 people dance until dawn at the biggest LGBTQI party in Australia, and ends the following day at Laneway, the ultimate recovery. 2. All the famous faces! There’s no shortage of iconic celebrities, performers, and entertainers who celebrate Sydney Mardi Gras. Multi award-winning Aussie dance stalwarts PNAU and pop sensation Kim Petras lead the first line-up announcement for the epic Mardi Gras Party, held directly after the iconic Parade. There’s more huge international and Australian artists soon to be announced. Last year’s Party featured the one and only Cher, so you know it’s going to be epic. 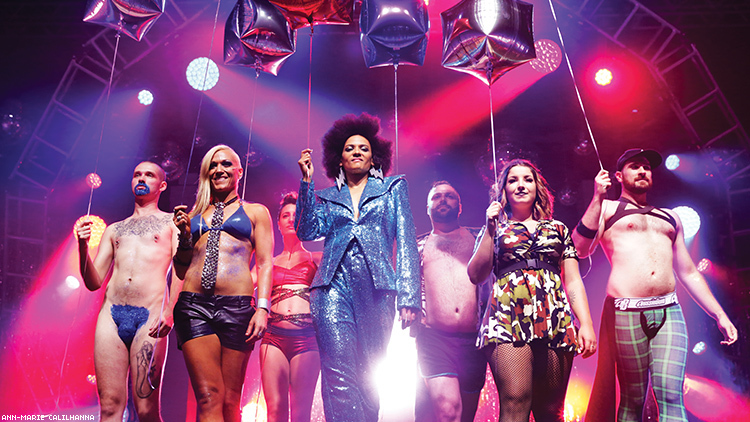 Bigger, better and gayer than ever, Trevor Ashley’s Mardi Gala returns to the Sydney Opera House's Concert Hall for one fabulous night only on Sunday, February 24. Live onstage with a 12 piece orchestra, this variety gala is jam-packed with surprises, laughs and power ballads, that will have everyone on their feet. Joining “Mardi Gras Royalty” Trevor Ashley is the deliciously camp Rhonda Burchmore, the electrifying Tim Campbell, the acerbic wit of Tom Ballard, Oxford St legends Shauna Jensen and Minnie Cooper, and more surprises! Everyone will be out and about at Bondi Beach, the beautiful harbor front and the thriving city center. However, Sydney is also a fantastic launching point to gorgeous destinations in New South Wales like the surf-chic beach town of Byron Bay, the breathtaking UNESCO listed Blue Mountains or the gorgeous Central Coast, just an hour’s drive from Sydney. With new boutique hotels and dining options such as Bell’s Kilcare and Pretty Beach House, it’s the perfect place to detox. Keep in mind Australia’s summer is our winter, so February and March are ideal times to visit for excellent outdoor weather. Sydney is indisputably Australia’s LGBTQI capital, with a community that is diverse, welcoming and flourishing in the city that famously embraces it. With dozens of gay bars, nightclubs, gay-owned restaurants and organizations, Sydney is one of the world’s top LGBTQI destinations, and you’ll find gay-friendly businesses on every corner. Have a cocktail at Opera Bar just outside the Sydney Opera House for a breathtaking sunset with views of the Sydney Harbour Bridge, stroll the historic Finger Wharf, and meet new friends at The Rose Hotel, the city’s prized local haunt. As a proud sponsor of the Sydney Gay & Lesbian Mardi Gras, there is no better way to fly to the land down under than with Qantas, Australia’s flagship carrier. With more nonstop flights from the U.S. to Australia than any other carrier, you’ll be spoilt for choice and arriving relaxed and ready to enjoy all Sydney has to offer. Qantas is the airline to fly the award-winning A380 – the world’s largest passenger jet – from the U.S. to Australia. Travelers can arrive fully rested in four classes of service, including International Premium Economy with spacious seats and personalized service; International Business with fully reclined beds, designer pajamas, and Qantas Curates amenity kits; and International First Suite with duvet and mattresses in luxurious beds, an eight-course tasting menu and award-winning wines and champagnes. Passengers get an authentic Australian experience even before landing, starting with the First Lounge in Los Angeles, signature warm Aussie hospitality during the flight, and cuisine designed by local celebrity chef Neil Perry. 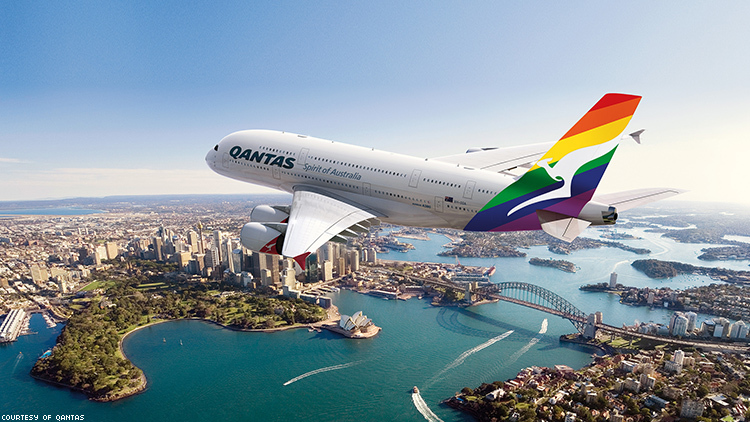 Qantas has also been a proud participant in the Sydney Gay & Lesbian Mardi Gras for more than 20 years and has taken great pride in creating stand-out floats for the parade. In 2013, Qantas became an official sponsor and more than 1,000 employees march with the airline each year. Pack your bags to join in the festivities of the Sydney Gay & Lesbian Mardi Gras, and fly with pride on Qantas. Click here to start your journey!